Ms. Wheelchair Iowa, Katie Helmers. Des Moines residents may spot an unusual sight this week: a row of perhaps 30 or 40 women in wheelchairs, many wearing sashes and tiaras, cruising the downtown’s sidewalks and skywalks. Iowa’s capitol city is hosting the Ms. Wheelchair America pageant, bringing in contestants from as far away as Alaska and Florida. The competition is a win-win for everyone involved, Hoit says, as its focus is on highlighting the abilities of people with disabilities. This marks the second time Des Moines has hosted this national event. The first time was in 2003. “It’s a major way for people to know about Iowa,” Hoit says. “I’ve already heard from the contestants who are here. They’ve never been to Iowa before and they’re anxious to see what Des Moines has to offer.” Hoit is a polio survivor and was the first Ms. Wheelchair Iowa in 1996 and she now runs the state program. This year’s event will feature competitors from 25 states. Why aren’t there representatives from all 50 states? 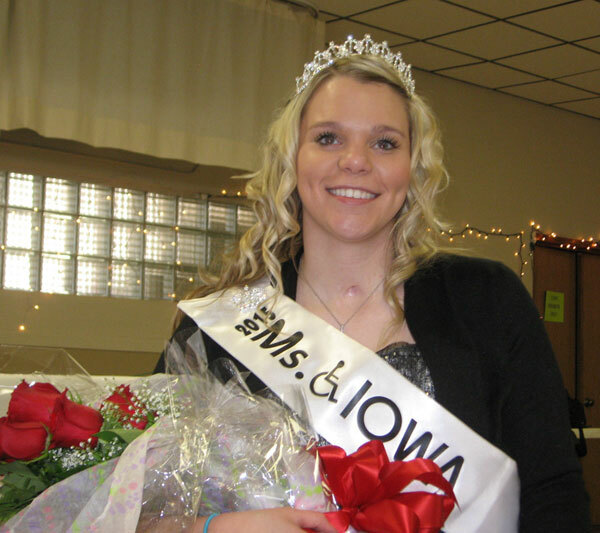 Iowa is being represented in this year’s pageant by Katie Helmers, Miss Wheelchair Iowa 2015. The 25-year-old Helmers is from Dakota City and lost the use of her legs in a car crash in 2013. The crowning event is open to the public and is scheduled for Saturday night at the downtown Des Moines Marriott.